Have you ever had a dream in a dream? 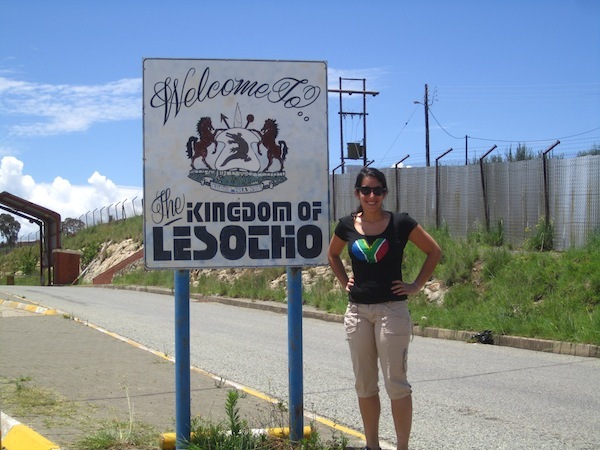 I have on many occasions, but Lesotho was my first country in a country. This landlocked state is completely surrounded by it’s neighbouring country South Africa (Take a look at this map for a visual). 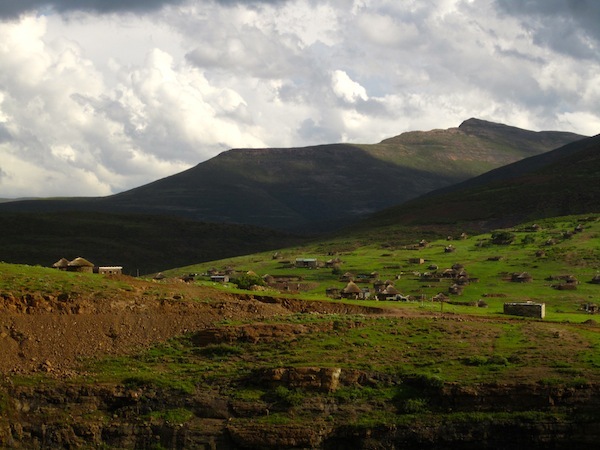 Other interesting facts about Lesotho are: it is the country with the highest low point, meaning it is the only independent state in the world who’s elevation is entirely above 1000 meters and consequently is home to the highest pub in Africa. With oodles of elevation facts to share, we spent three nights in this stunningly beautiful mountainous country, on the highest ground I have yet to stand on. Testing the waters to see if the CRV can make it. It was not an easy task getting to our accomodations. First we had to drive way up into the mountains through winding switchbacks, and then back down again into a valley. On our decent, the paved roads ended and were replaced by a rocky, muddy, wet, steep, narrow and unkept road. Tyron’s parents were zooming along in a boki (SA slang for truck), while we slowly crept down in Wendy’s brand new Honda C-RV. When we pulled out the manual to find out how to switch on the 4×4, we were amused by its description of its capabilities – ‘the CRV is intended for driving on paved roads, but may also be used to drive on dirt road, to get to your campsite”. I don’t think this was the type of dirt path it was referring to. I think it is fair to say we pushed the limits on the car, and it succeeded admirably. It was a rather treacherous road, as we slipped through the thick mud, avoiding massive pot holes and skimming the edge of high cliffs. We even had to ford a few river crossings. I was thankful not to be driving, and passed the time by making an escape plan just incase the car went over the edge (most of the time this involved closing my eyes and hoping for the best). Luckily, I didn’t really have a reason to be worried, I was in good hands and Tyron safely got us down to the bottom of the valley. On the way to our spot we passed Afriski, which becomes a ski resort during the winter months. There was a series of chalets complete with a ski skilift . While it may have looked like a toboggan hill to a Canadian, in a region where skiing is a rare occurrence, it was quite an interesting spectacle. When I fist saw the village, I assumed that an entire family would live in one hut, but I learned that a family may actually occupy 4 or 5 different huts at a time. One for cooking, one for sleeping, and there may also be additional huts for the children. We got to peak inside a few model rondavles at the cultural centre in town. This protects the fire from the wind, depending on which direction it is blowing. The local inhabitants are the Sotho people, who traditionally wear gum boots on their feet and wrap themselves in wool blankets. The blankets are a significant part of the countries culture, and were first brought over by European traders. Not only do the blankets keep them warm and dry as they heard their flocks of sheep, horses, cattle and goats through the mountains, but the colour and pattern indicates their status and political affiliations. As we drove through the country, we saw many herds of live stock grazing in the mountains, and migrating from one village to the next. 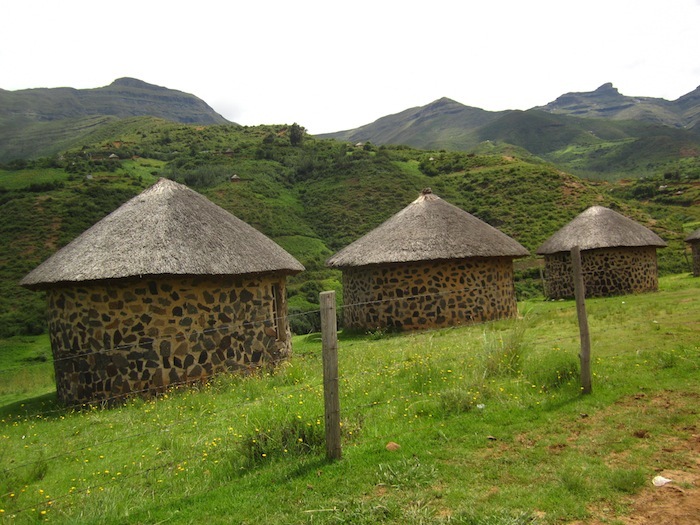 Every now and then I would spot the silhouette of a pile of rocks that had been stacked together to look like a blanketed Sotho standing watch over the fields in order to keep predators away from their animals – their version of a scarecrow. When we finally got to our camp, we unpacked and had beers to relax after a stressful drive. Off in the distance, we could see a local soccer match in action. The crowd was cheering like crazy, and someone was even blowing a vuvazela. We spent the next few days fly fishing for trout, walking along the river, and taking in the gorgeous scenery. It truly was a beautiful country. Land border crossing to the 16th country I have visited. I am glad you were allowed to enter Lesotho without a visa! the questions at the border post still make me chuckle! Also I appreciate that your comments re the ski slopes of Afriski are so kind. Sounds amazing! And the photos of the huts are cool – it kinda reminds me of historical Aboriginal homes in Canada.